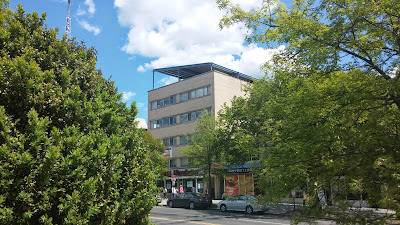 On May 2, I went up to get some photos of this solar canopy I saw on WI Ave. The canopy is a metal structure (15 vertical poles and a lot of I-beam framing) that covers the entire roof of the Albemarle building in Tenley Town. The address is 4437 Wisconsin Ave in NW DC. Prospect Solar is the installer and responded quickly to my Twitter request for more information. They informed me that the solar canopy has been in service since June of 2012. There are 162 Sharp 240-watt panels and an equal number of Enphase micro-inverters. If you multiply that out, that's a total of 38.88 kilowatts of potential power. If that thing is kicking at full capacity, it could power 648 standard 60-watt light-bulbs. My guess is that they're net-metered and getting a nice return from our utility, Pepco for all of the power they're producing. As for my quest to get onto the roof...I made it into the building but the roof-access door was locked. I had to settle for photos from across the street (above) and the Whole Foods parking lot to the north. I went with the above shot because the trees and bushes provide nice framing. Finally, I wonder what sort of waterfall this canopy creates in a rainstorm.